Xanthurenic acid is an endogenous molecule produced by tryptophan degradation, produced in the cytoplasm and mitochondria. Its accumulation can be observed in aging-related diseases, e.g. senile cataract and infectious disease. We previously reported that xanthurenic acid provokes apoptosis, and now present a study of the response of mitochondria to xanthurenic acid. Xanthurenic acid at 10 or 20 μM in culture media of human aortic smooth muscle cells induces translocation of the proteins Bax, Bak, Bclxs, and Bad into mitochondria. In 20 μM xanthurenic acid, Bax is also translocated to the nucleus. In isolated mitochondria xanthurenic acid leads to Bax and Bclxs oligomerization, accumulation of Ca2+, and increased oxygen consumption. Xanthurenic acid interacts directly with Bcl-2 family proteins, inducing mitochondrial pathways of apoptosis and impairing mitochondrial functions. Xanthurenic acid is an endogenous molecule derived from tryptophan degradation by indoleamine-2, 3-dioxygenase. Indoleamine-2, 3-dioxygenase is induced in infectious diseases by liposacharides, interferon-α, and superoxide radicals . Xanthurenic acid is enzymatically formed by transamination of 3-hydroxykynurenine by kynurenine-aminotransferase . Kynurenine-aminotransferase, has been cloned from mitochondria and cytoplasm [3, 4]. Xanthurenic acid accumulates with age in senile cataract [5–7]. Previously, we reported that this acid leads to apoptotic-like cell death [8–10], its BH3 domain in the cytoplasm being responsible for targeting the protein to mitochondria, resulting in cytochrome c release [11, 12]. We now report that proteins with a BH3-domain (Bax, Bak, Bcl-xs, Bad) are transformed in the presence of xanthurenic acid to their proapoptotic-inducing state and translocated to mitochondria. In vitro, xanthurenic acid leads to covalent oligomerization of Bax, and Bcl-xs. It also alters mitochondrial Ca2+ transport, and increases oxygen consumption. The fate of Bax, Bak, Bclxs, and Bad in cultures of aortic human smooth muscle cells (HSMC) has been compared with control cells, using the antibody against Bax, which stains cells uniformly (Fig. 1A). 10 μM xanthurenic acid results in Bax being translocated to mitochondria (Fig. 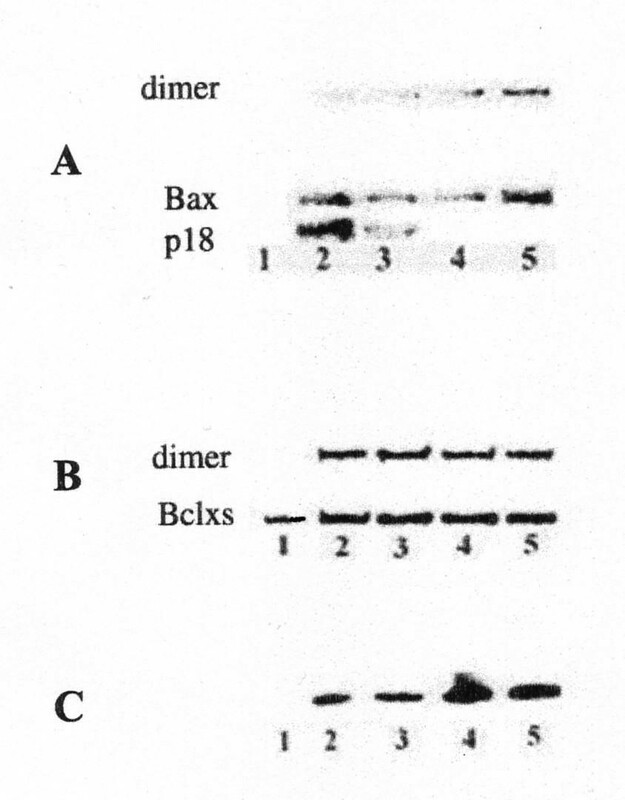 1B), and at 20 μM, Bax seems to be translocated from mitochondria to nuclei (Fig. 1C). However, at the latter concentration, some Bax remained detectable in mitochondria (Fig. 1C). Granular bodies strongly staining with anti-Bax antibodies (green) were detected in the nucleus (Fig. 1C). Translocation of Bax to the nucleus during apoptosis has previously been reported . Proapoptotic proteins Bak, Bclxs and Bad (Fig. 2A,2B,2C) at 10 and 20 μM xanthurenic acid (Fig. 2D,2E,2F) were translocated into mitochondria. 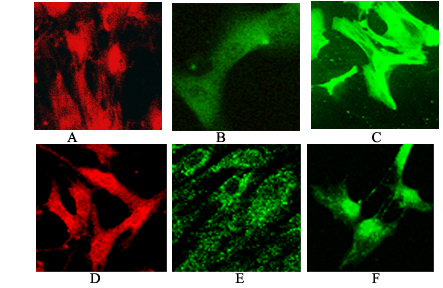 Primary cell cultures human smooth muscle cells (A-C, Bax): (A) in control cells (magnification 400×), (B) in the presence of 10 μM xanthurenic acid (magnification 1260×), (C) in the presence of 20 μM xanthurenic acid (magnification 630×): mitochondria stained with MitotrackerRos (red staining), Bax (green), yellow-colocalization of Bax with mitochondria. Primary cell cultures human smooth muscle cells. (A-D, Bak): (A) Bak in control cells (magnification 800×) (D) Bak in presence of 20 μM xanthurenic acid (magnification 800×), (B-E, Bclxs): (B) Bclxs in control cells (magnification 1000×), (E) Bclxs in the presence of 10 μM xanthurenic acid (magnification 1260×), (C-F, Bad): (C) Bad in control cells (magnification 800×), (F) Bad 20 μM xanthurenic acid (magnification 800×). Both Bcl-xs and Bax were found in the 10,000 g mitochondrial fraction of rat liver. When it was incubated with xanthurenic acid at 5–10 μM (1 mg of protein/ ml), cleavage of Bax with formation of p18 was observed. Both anti-Bax and anti-Bcl-xs recognized the N-terminal part of the proteins, suggesting that the cleavage was more towards the C-terminal domain. When the concentration of xanthurenic acid was increased to 20–40 μM (1 mg protein/ml), Bax dimerized (Fig. 3A). Western blot analysis showed an increase of staining and dimerization of Bcl-xs in the presence of xanthurenic acid (Fig. 3B). In the mitochondrial fraction, incubation of Bcl-xs and Bax, with xanthurenic acid led to stronger attachment of the correspondent IgG antibody than in control cells, indicating some form of posttranscriptional modification. Dimers of the proapoptotic proteins in the presence of xanthurenic acid showed up on SDS-PAGE, confirming the formation of covalent crosslinking. Bax and Bclxs were faintly detectable in the mitochondrial pellets. Cytochrome c release was observed in the same protein extract (Fig. 3C). Western blot analysis of supernatant from rat liver mitochondria incubated for 1 h in the presence of xanthurenic acid for Bax, Bcl-xsand cytochrome c; (A-B) Western blot analysis of Bax and Bcl-xs: lane 1-control mitochondria; lanes 2–5: mitochondria incubated in the presence of xanthurenic acid at concentration 5; 10; 20; and 40 μM per mg of protein (A) Bax; (B) Bcl-xs, (C) release of cytochrome c from mitochondria in the presence of xanthurenic acid at the same concentrations as in (A-B). Ca2+ release was measured with Arsenazo III at a wavelength of 685/675 nm, using an Aminco DW-2 spectrophotometer. Xanthurenic acid at 15 μM (1 mg protein/ml) did not alter the release of Ca2+, but inhibition did occur at 66 μM (1 mg protein/ml). 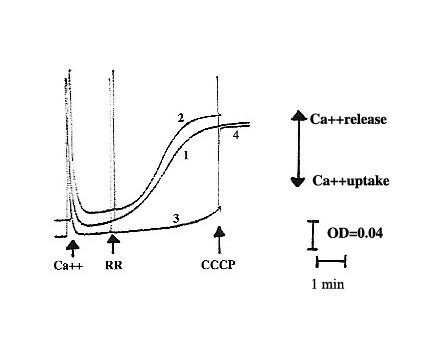 Ca2+ retained in mitochondria at this concentration was liberated after addition of 1 μM carbonyl cyanide-m-chlorophenylhydrazone (CCCP), which is known to provoke a loss of potential across mitochondrial membranes (Fig. 4). These results indicate that xanthurenic acid is involved in the modification of mitochondrial Ca2+ release, but does not lead to a loss of the mitochondrial membrane potential. Ca2+ release from mitochondria in the presence of xanthurenic acid (1) control mitochondria, (2, 3) in the presence of xanthurenic acid, and 1 mg of mitochondrial proteins: (2) 15 μM xanthurenic acid, (3) in the presence of 66 μM xanthurenic acid (4) after addition of CCCP to (3). Consumption of O2 was measured with a Clarke-type electrode (Fig. 5). Mitochondrial respiration was supported with 2.5 mM potassium succinate prior to xanthurenic acid being added at 0.4 (Fig. 5, curve 1) or 4 μM (Fig. 5, curve 2). Xanthurenic acid stimulated oxygen consumption in a concentration-dependent manner. 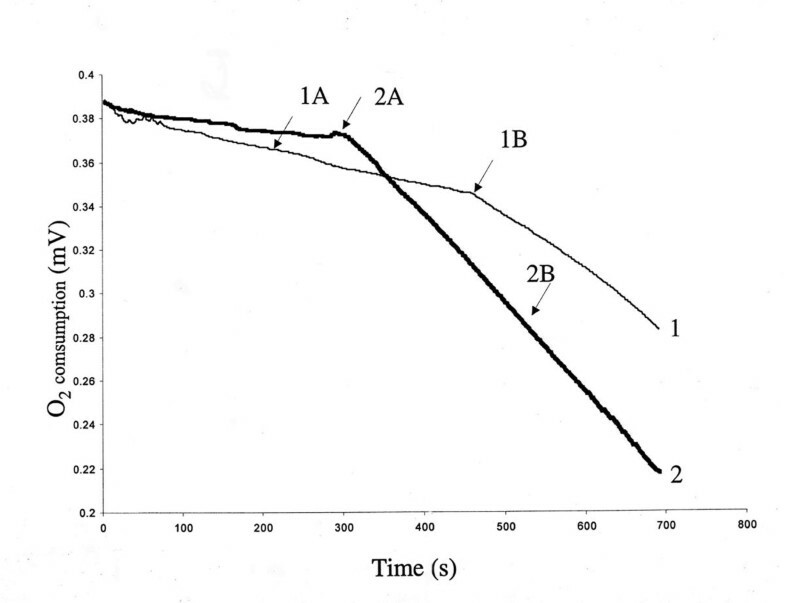 Mitochondrial oxygen consumption in presence of xanthurenic acid per 1 mg of protein in the presence of (1) 0.4 μM xanthurenic acid, and (2) 4 μM xanthurenic. Apoptosis in the presence of xanthurenic acid is associated with cytochrome c release [8–10]. Our investigations show that xanthurenic acid induces the translocation of proapoptotic Bcl-2 proteins to mitochondria. A posttranscriptional modification of these proteins is suggested by the direct crosslinking of Bax and Bcl-xs in isolated mitochondria. Previously, BID was reported to change the conformation of Bax . Recently, we reported that accumulation of xanthurenic acid in cells interrupts the interaction of Bad with signalling proteins of the 14-3-3 family . However, here we have shown that Bax is dimerized in isolated mitochondria, indicating that xanthurenic acid itself induces a conformational change of the proteins. Using Western blotting, Bax in mitochondria incubated with xanthurenic acid was detected more readily than in controls. This phenomenon was previously reported to indicate a change in Bax folding which results in a better exposition of the N-terminal part of Bax for the antibody after exposure to apoptotic stimuli . Furthermore, xanthurenic acid appeared to modify the folding of proteins , which could be the reason for the increased IgG binding to proteins in the presence of xanthurenic acid. Our results indicate that xanthurenic acid is an endogenous crosslinker of Bax and Bclxs proteins with a BH3 domain. Xanthurenic acid leads to translocation of BH3 proteins into mitochondria in human smooth muscle aortic cells. However, in isolated mitochondria, dimerized Bax and Bclxs found in the mitochondrial supernatant, are almost undetectable in the pellets, indicating that an additional cytoplasmic protein is necessary for translocation of these proteins into mitochondrial membranes. Therefore, the observed cytochrome c release in the presence of xanthurenic acid in isolated mitochondria is not mediated by Bax dimerization. At lower concentrations of xanthurenic acid, cleavage of Bax produced p18, which has been previously shown to enhance apoptosis . Bax dimerization also has been shown to induce caspase-independent cell death . Xanthurenic acid at 20 μM causes Bax translocation into the nucleus, and plays a key role in apoptosis, because Bax/Bak deficient cells were resistant to the apoptotic stimuli staurosporine and etoposide . The fact that xanthurenic acid can directly provoke Bax and Bcl-xs crosslinking suggests that an accumulation of xanthurenic acid in a cell is sufficient to induce the cell death. Xanthurenic acid might be oxidized in vivo to its semiquinone, and further to quinone-di-oxo-xanthurenic acid, as previously described . The semiquinone is an oxidative stress , which can lead to uncoupling of mitochondria, characterized by an increase of O2 consumption; in keeping, we noted an increased consumption of O2 in the presence of xanthurenic acid. Previously it was reported that Bax is only toxic in the presence of active oxidative phosphorylation . Our results indicate that at 20 μM xanthurenic acid, Bax is translocated into the nucleus and Ca2+ release from mitochondria is blocked. Xanthurenic acid accumulation in mitochondria does not affect mitochondrial membrane potential, because Ca2+ was accumulated in the mitochondria and CCCP was able to release Ca2+ under these conditions. Previously it was reported that Bax/Bax-induced apoptosis was associated with an uptake of mitochondrial Ca2+ by an unknown mechanism. An excessive Ca2+ load may induce apoptosis by stimulating the release of apoptosis-promoting factors from the mitochondrial membrane space to the cytoplasm, leading to impaired mitochondrial function (for review ). The results presented here indicate that the accumulation of xanthurenic acid in the human aortic smooth muscle cell causes a proapototic conformation of the mitochondrial proteins, Bax, Bak, Bcl-xs, and Bad. It was previously reported, that mitochondrial Bax plays an essential role in cytochrome c release, which can occur via Ca2+-dependent and -independent mechanisms . Bax-driven apoptosis may be important for development of diabetes, atherosclerosis and neurological disorder [24–28]. We surmise that an accumulation of the endogenous aromatic amine, xanthurenic acid, may lead to organ failure. The following polyclonal antibodies were obtained from Santa Cruz Biotechnology Inc. CA, USA: antibody against cytochrome c, against N-terminal part of Bax, Bak, Bcl-xs, and Bad. IgG secondary antibodies–Texas Red conjugated were from Santa Cruz or secondary antibodies IgG–Alexa 488 conjugated Molecular Probes (Leiden, The Netherlands). Carbonyl cyanide-m-chlorophenylhydrazone (CCCP) and Arsenazo III were from Sigma. The normal human aortic smooth muscle cells were from PromoCell GmbH, Heidelberg, Germany. The cells were cultivated in Smooth Muscle Cells Growth Medium 2 (SMCGM2) with an addition of Supplement Pack/Smooth Muscle Cells (PromoCell). Cells were grown under a humidified atmosphere of 5% CO2 in air at 37°C. When confluent, they were incubated for 96 hours in the SMCGM2 or this medium supplemented with 10 and 20 μM xanthurenic acid. A 20 mM stock solution of xanthurenic acid was prepared in 0.5 M NaHCO3, and diluted in 0.01 M PBS pH 7.4. Rat liver mitochondria (80–90 mg protein per ml) were isolated, as described previously . The 10,000 g mitochondrial fraction of cells was used (referred herein as mitochondria). The mitochondria were in MSH buffer (210 mM mannitol, 70 mM sucrose, 5 mM Hepes, pH 7.35 (4°C, 2 M KOH). Mitochondria (~3 mg protein per 100 μl of reaction mixture) were incubated for 1 h at room temperature without xanthurenic acid or in the presence of the increasing concentrations of xanthurenic acid from 5 to 40 μM per mg protein in the presence of the following protease inhibitors: 0.1 mM phenyl-methylsulfonyl fluoride, and leupeptin, aprotinin, and pepstatin, each at 1 μg/ml. Thereafter, the sample was centrifuged for 10 min at 14,000 g, and the supernatant boiled in loading-buffer for 5 min. Proteins at 100 μg per lane were separated by SDS-PAGE containing 12.5% acrylamide. After transfer to Hybond ECL membrane (Amersham Pharmacia Biotech AB, Uppsala, Sweden), the proteins were probed with the appropriate antibodies. Chemiluminescence ECL system (Amersham Pharmacia Biotech AB, Uppsala, Sweden) was used for the detection of peroxidase-conjugated secondary antibody. Cells grown on glass coverslips were fixed for 10 min at room temperature in 4% paraformaldehyde in 0.1 M PIPES, pH 6.8, washed in PBS and permeabilized for 5 min in PIPES containing 0.05% saponin (65 μl per coverslip), washed in PBS, incubated for 10 min in cold acetone for additional fixing and permeabilisation, and again washed in PBS. Cells were incubated for 1.5 h with the first antibody diluted in PBS containing 1% bovine serum albumin, and after further washing incubated for 1.5 h with the secondary antibody. The coverslips were washed in PBS and incubated for 10 min with 65 μl of solution containing 1 μl of Hoechst 33342 dye (1 mg/ml), washed in PBS, and incubated with Antifade Kits (Molecular Probes, Leiden, The Netherlands) according to the supplier's instruction. An Aminco DW-2A spectrophotometer was used at 685–675 nm the presence of 50 μM Arzenazo III, and mitochondrial respiration was measured using a Clarke-electrode as described previously . Briefly, mitochondria (1 mg of mitochondrial protein/ml) were energized with 2.5 mM potassium succinate in the presence of rotenone. After Ca2+ uptake was complete, the uptake blocker, ruthenium red (RR), was added to see net release Ca2+ in the presence or absence of xanthurenic acid. This work was supported by grant awarded to H. Z. M. by the Swiss National Science Foundation (32-59183.99), Swiss Heart Foundation, and MSE-Pharmaceutika GMBH, Bad Homburg, Germany. We thank Dr. C. Richter for proofreading the manuscript and Dr. M. Salvi for his help with Ca2+ release experiment. HZM: conception, design, data collection and analysis, writing the paper. OMH: revising the paper, research funds collection. All authors approved the final version of the paper.